In the final segment of this series, PART 3 takes a look at some impressive acts of creativity by individuals who chose not to let their ailments get in the way of their creativity. Many artists who have been riddled with pain have used their art as a release, an escape from the entrapment of their bodies. Mexican artist who had chronic pain her who life. When Kahlo was 6 years old she contracted polio, which made her right leg shorter and thinner than the left. At the age of 18, Frida was riding in a bus when the vehicle collided with a trolley car. Kahlo suffered near fatal injuries as a result of the accident, including a broken spinal column, a broken collarbone, broken ribs, a broken pelvis, eleven fractures in her right leg, a crushed and dislocated right foot, and a dislocated shoulder. An iron handrail impaled her through her pelvis, fracturing the pelvic bone. She endured more than 30 operations in her lifetime and during her convalescence she began to paint . Her treatment included wearing a plaster corset which confined her to bed. 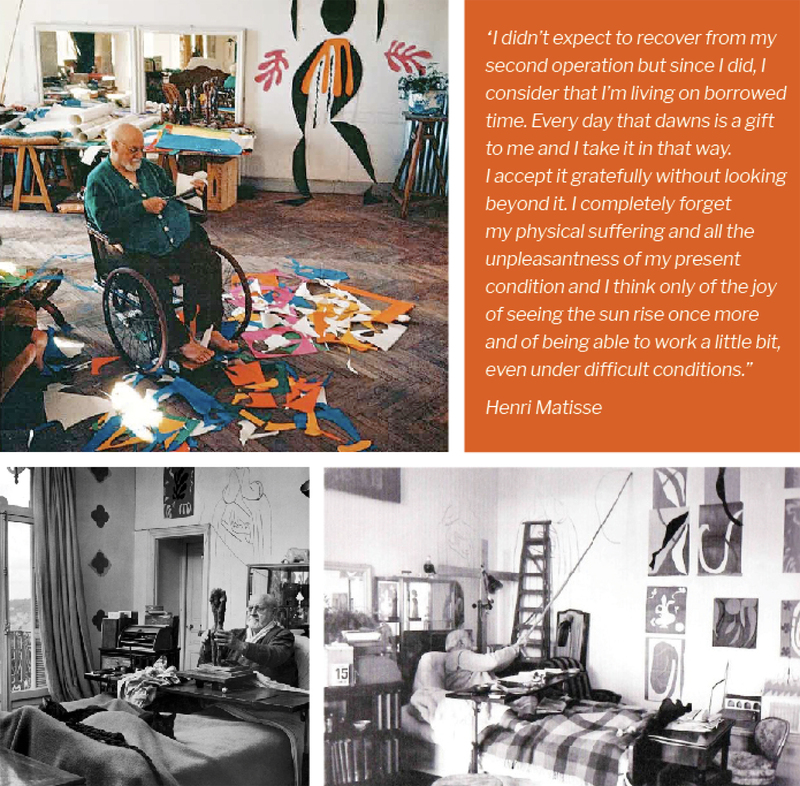 Diagnosed with abdominal cancer in 1941, French artist Henri Matisse underwent surgery that left him chair and bed bound. Painting and sculpture had become physical challenges, so he turned to a new type of medium. With the help of his assistants, he began creating cut paper collages. He even had a few cat assistants! Close had trouble remembering names and dates. Turns out he also suffers from prosopagnosia, or face blindness, where he can’t recognise faces. Despite this Close worked hard to show success in school. He sat in the front rows, participated frequently, and even would sit in a dark room, shining a flashlight on a page of text and read it out loud until he remembered. Close got through school by making art. He would “drag extra-credit murals and maps and charts into class” to prove to his teacher that he was neither dumb nor lazy. Despite his difficulties Close became successful in his pursuit of art. He lived by the motto “Go to Yale or go to jail,” striving for a successful art career at the university. His parents were supportive of his love for art, which gave him the motivation to work hard. He is an artist obsessed with the process of making art, as much as with the result. He started to create large photo realistic portraits in order for him to understand the terrain of a face. In time when America was in love with abstracts he chose to do photorealism. He is also known for his photo montages. His has developed a unique visual lange for his portraits which are comprised of abstract shapes on small squares, painted in a gridlike format. When viewed from afar, they combine to reflect large scale portraits. 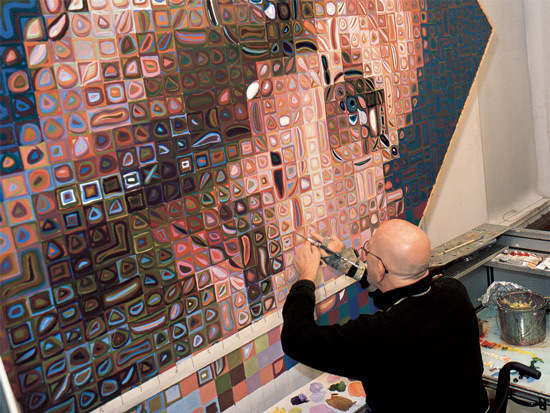 For Chuck Close his health issues continue to plague his art making. In 1988 he became a quadriplegic as a result of sudden catastrophic spinal artery collapse. He fought back to regain partial usage of his limbs. Seen here here painting in his wheelchair he tapes his paint brush his hands in order to keep creating new work. He is noted as one of the most productive and successful artists living today. A mixed-media artist and author of Tattoo a Banana. In art school, Phil Hansen developed an unruly tremor in his hand that kept him from creating the pointillist drawings he loved. Hansen was devastated, floating without a sense of purpose. Until a neurologist made a simple suggestion: embrace this limitation … and transcend it. He now he creates art using karate chops and tatooing bananas! We ain’t getting any younger! So if art just isn’t your thing, then having more challenges to encounter is not going to get you started. One of the things creative folk forget all the time is how much their creative pursuits can give others joy. 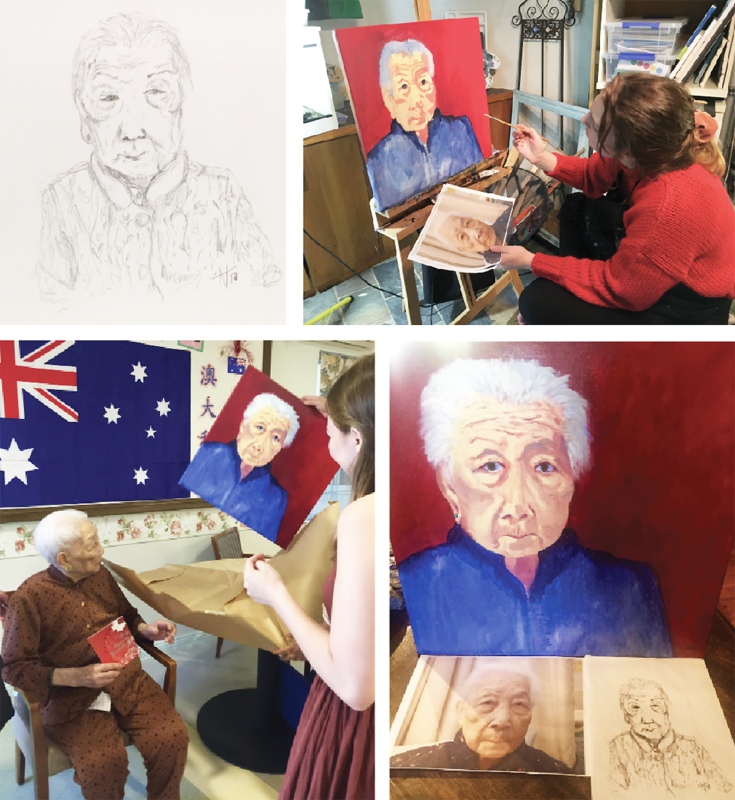 Recently one of my students, Abira Harvey participated in a Centennial program where each young artist was assigned to create a portrait of an individual aged 100. They had to meet this person and try and create a work befitting of the sitter’s life and likes. Mrs Kim Nga only spoke Chinese so they had to have a translator. Abira did a sketch on site then combined some of the things that defined Kim’s life into the artwork. A learning experience for both parties, it was not only a great art exercise but an amazing way to connect, expand and share experiences with a different community. Both artist and sitter where overjoyed with the result! You can see from these inspirational stories that art can provide a fabulous place to go when things get tough. For some it can be a comfort, a place to reconnect with what they believe in. For others, it is a place to escape, unhindered but physical disabilities. 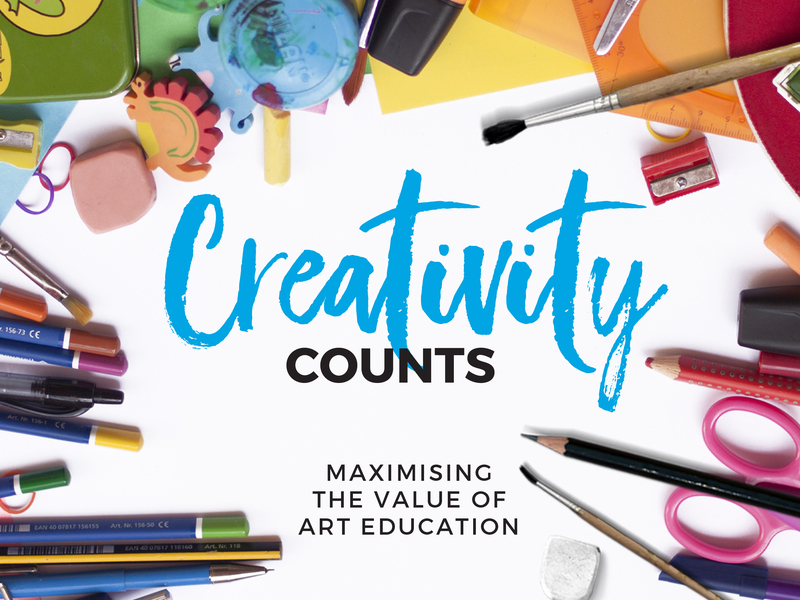 Whatever the reason, we know that art and art making is not only for the young. If the evidence is true, it can only give us more as we get older. It can provide a way to help us connect to others and reconnect with ourselves. As we get older, the advantage we have is all the years of experience we have at living. Our views, interpratations and insights are unique. No two people remember the same experience identically. Our versions, how we see the world is the magic. The creating, is the practice and the result is the mirror. Sometimes its an experiment and sometimes its a plan, but whatever way we start, we now know that art can be the best (and cheapest) ‘feel good’ medicines on the market, and it’s something you can never be too old to take up. 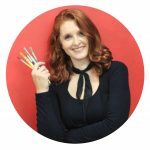 I hope you enjoyed these articles on Art, Ageing and Creativity. The perfect way to kick start your creativity? Join me in Fiji on my annual Art Retreat where you can relax, rejuvenate and create in paradise!